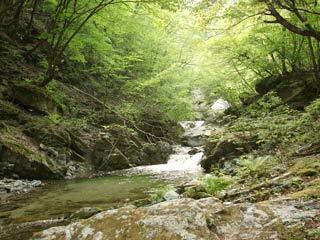 Ishiutorogawa Valley (石空川渓谷) is located in Minami Alps National Park. The water is coming from Mt. Jizo (2,764m). There is many waterfalls in the hiking course, especially Shoji Falls is one of the 100 best waterfalls in Japan and highest waterfalls in Eastern Japan. There is a parking and restroom at the parking. 40 min. from the paring to the observatory of Shoji Falls. 1. use root 20 to Makihara cross and make left. There are 5 waterfalls in the hiking courses. Shoji Fall and the road will be closed in winter (from 12 to 4) Also, it will be closed after the heavy rain.